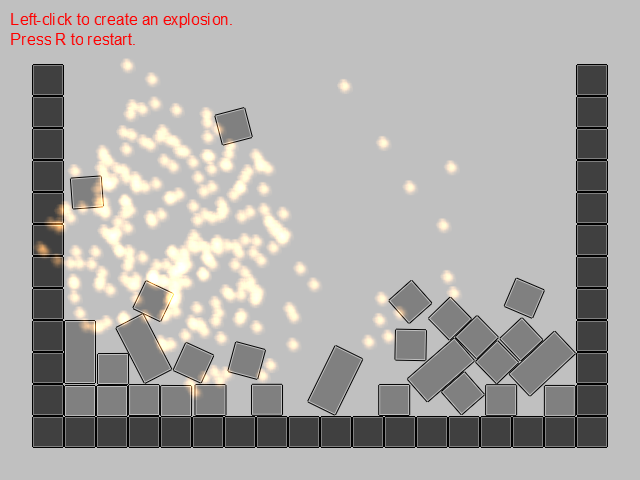 ExtremePhysics is a 2D physics simulation engine designed for Game Maker. 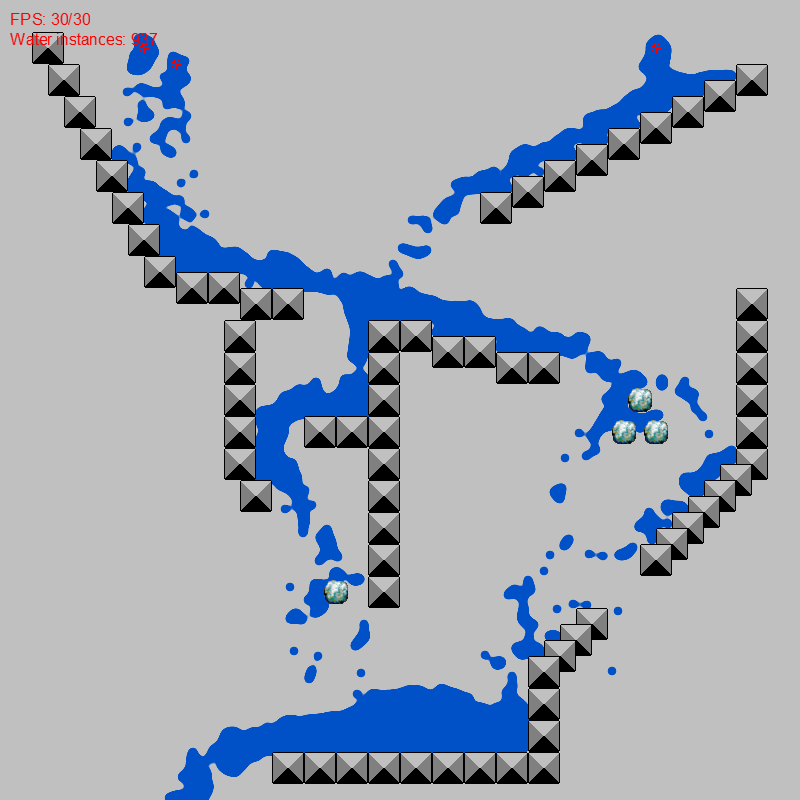 It allows you to use complex physics in your games without having to worry about the math involved. ExtremePhysics is written in C++, which is a lot faster than GML. 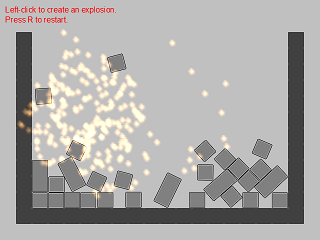 You can easily add hundreds of objects that collide with each other to your game without slowing it down. 1600 bodies at 40fps on my computer: Intel Core2 Duo 2.5Ghz - using only one core. Without drawing it's even faster (85-90 fps). Thanks to SapperEngineer there's also a Mac version. His topic is here. The Mac version should be almost identical to the Windows version, however this zip file only contains the GEX and the fluid simulation example. If you want more examples, you can copy the GMKs from the Windows version. I've also made a Python version as a proof of concept, more info is on my website. ExtremePhysics is distributed under the terms of the GNU Lesser General Public License. Edited by Maarten Baert, 24 February 2013 - 01:12 AM. Version 1.0 doesn't draw anything in the DLL. Version 2.0 does, but only for debugging. When using the extension (instead of the scripts), drawing objects in GM instead of in the DLL won't make a huge difference. The scripts and external_call function calls are slow, not GM's drawing functions. I am using the scripts instead of the extension in 2.0 for now, because it makes testing the DLL a lot easier. Oh I see the variable name confused me. And I get the bit method for grouping, that's what gmbullet does. asking for ds_ elements is faster than calling api functions. drawForMe() in the draw event. I guaranty, this will beat the crap out of GMPhysics for the number of object you can handle. Edited by icuurd12b42, 21 September 2009 - 12:23 AM. This would tell the DLL to write the new position to id.x, id.y and id.z. But I don't think this is possible. The ds_list method is probably faster when using scripts, but I am not so sure if it will still be faster when using the extension. 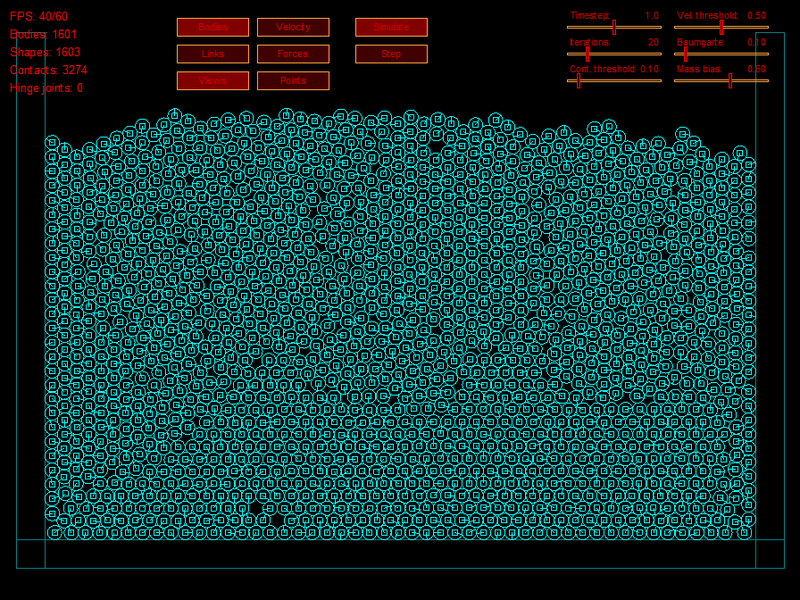 The downside is the code will waste a lot of time updating objects the player can't see anyway. Also I don't want to make the DLL dependent on gmlib because I am not sure it will be possible to use the same hack in GM8 (the runner was converted to C++). But I will test this method to see if it makes the dll faster. I don't want to add the drawing code to the DLL because it will make drawing very limited. And I don't want to add 100 functions just to get reasonable drawing and a small performance boost. If this is still not fast enough, you should use the physics engine in C++ directly instead of using GM (it will be open source). GM8 being the same core system as 6 and 7 (no it's not c++ yet), I'm pretty sure it wont take long for gmlib to have the gm8 interface defined. Yep, being open source, I can see myself adding the features I want though so you dont have to take these suggestion on. Just be sure your class or struct allows adding user data easily (such as extra info to store instance id and sprites and such). No problem, I am using normal C++ classes for the entire engine, the functions in GM are actually just wrapper functions. You could even rewrite all wrapper functions yourself if you want. The callback-script method sounds interesting, I will try that too. Do you know if a ds_map is slower/faster than a ds_list? I could use maps for all variables and use the (EP) id of the object as the key. Is it me or are physics dlls, all the rage lately? Maps are slower than lists. But faster if you access data non sequentialy. If I run through the entire list, list is what you need. With maps, youwould only be able to associate one variable data anyway. Most other ones are 3D that are good (GMNewton) that is now getting 2D scripts, but it still simulates the Z axis which makes it slightly slower. Thanx for the GMC contribution with the Physics engine. Edited by Postality, 22 September 2009 - 09:18 PM. In the room with all 1003 objects, I got 45 at the lowest, usually 50. Also, it's really really fun to set the vel. 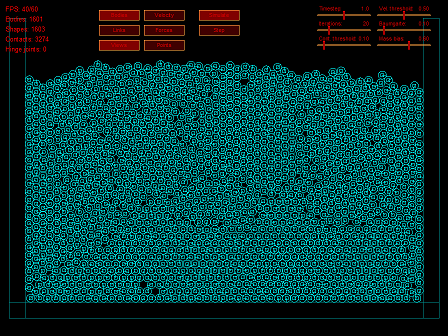 iterations to 1, then quickly move the slider way up, and watch all the balls go flying away. I like this though, keep up the good work. I compared ds_maps vs ds_lists a while ago and they are quite slower. It is possible that a ds_map call is as slow as an API call. This to show you to be careful you dont waste time implementing stuff for nothing. This seems awesome. I'm really looking forward to giving it a go once there's a more easily understandable example to work from. Great job, man! I was heartbroken when CoderChris abandon GMphysics and its nice to see someone create a physics engine that rivals GMphysics. Since GMphysics dosent work for vista I have been searching for a decent 2D engine and this one makes the cut. I look forward to see future development and I cant wait until its stable enough for me to create a game. Edited by theludicrous, 02 October 2009 - 05:34 PM. Edited by theludicrous, 04 October 2009 - 07:05 PM. WOW, great! If you could change the background color from green to gray/silver it would be perfect! The green doesn't go very well with my color scheme . Great! And with alpha channel ! Unfortunately I haven't had that much time to work on the code because I had to study. It will take a bit longer than I expected to finish v2.0. During the rewrite I got stuck all the time because I was trying to add too many new features at the same time. So I have decided to finish the rewrite first without these features and release it (v2.0) and add the features later (v2.1). That way I will be able to release it faster, and it will probably be more stable as I am only reusing features I have tested already. in a game. All tests use debugdraw for graphics because this is easier, but you should NOT do this in a real game! Where is this empty_engine.gmk file? It's not packaged with the zip and I've searched the forum to see if there's a download but can't find one. Edited by wargasm, 09 October 2009 - 11:32 AM. // Initiate the dll? Not sure how this works yet. // Initiate the GML functions? // Create a world for the physics objects. I'm assuming the function returns the world id which I am setting to the arena variable. No parameters to set the world position and dimensions? Default = room size? // Create a box (is this just a collision box or should it be visible?) for my player object which atm is just a 64x64 box sprite. I'm assuming the last 2 parameters are a boolean and float. (rotation 0/1, density 0-X.....X being whatever the maximum density is). // Set the gravity of the player object. Assuming last 2 parameters (x, y) to be floats. // Set the mass of the player object. Assuming the last parameter (mass) to be a float. When running this im given the error "ep_object_set_gravity: Can not set gravity of ground object in world 1". Where am I going wrong and can someone please clarify on the questions in the comments? Thanks. Edited by wargasm, 09 October 2009 - 01:22 PM. It's not finished yet and I had forgotten I had mentioned it. This is just an alpha version, not the final engine (I still have to make a .gex and a help file). So, hows the engine going? Better, I finally managed to install Visual C++ on this computer, so I can compile the DLL in VC++ now. VC++ seems to generate faster code so this will make the DLL even faster . But there is still a lot of work to do, though. I was wondering, what would be the best way to use the engine in C++? bad idea. some data types for c++ version will be better than double. So make LIB for c++ version, and wrap it to GM version. No, I meant putting all functions in one DLL: C++ classes and c-style (GM) functions. GM will just ignore the classes and C++ can use them. So make LIB for c++ version, and wrap it to GM version. I don't want to recompile two projects every time I make a change to the code, just to test it . In that case, I would suggest a dll that is usable by both C++ and GM. The file size would be slightly increased, but would be easier for you to maintain. Basically one would create the functions optimized for C++ and then create wrapper functions for GM that recast value types as needed. There's my 2 cents. Project dependencies are a simple way to tell Code::Blocks that a given project "depends" on another (in the same workspace, always). Thus imagine in your workspace you have a library project and an executable project which depends on the library. Then you could (and should) tell Code::Blocks about this dependency. To do this, you select "Project->Properties" and click the "Project's dependencies.." button. I will just create a GCC library and a DLL for GM using that library, and I will create libraries for other compilers later. I have finished the structure of the engine, but there's still a lot of code that has to be rewritten. And how is it going? Almost done or do you still need to do a lot rewritting? Please don't pull a 'coder-Chris' on us! Edited by theludicrous, 09 November 2009 - 01:36 AM. Does it support concave polygons? This is great. Seems to be really fast. Finally we can have physics in Vista and 7.
in the future can you please make a stack of tutorials, complex ones and simple ones, i just found the one there now hard to understand, btw what let GmPhysics down was lack of documentation and explanation on lots of the functions. Please don't let that happen to this, it seems to good! No, but you can create concave polygons by dividing them into multiple convex polygons. I could even try to make the engine do that automatically, but it's very hard to generate a good subdivision. This is what I want to do, but I haven't found a good algorithm yet. The first example looks very good, I will add that in v2.1 if possible. I've rewritten half of the code so far (100kb ). The other half should be easier because I don't have to change it completely. The only thing is that people usually define vertices clockwise.... So be careful. I have no idea why the implementation is backwards (or maybe I am).